Removable Date Food Labels help Restaurants and Kitchens to keep food and ingredients fresh and cycle through the food in a timely manner. These Restaurant Supply Food Labels from Daymark and National Checking are used in refrigerators, freezers and other spots in the kitchen to label food bags and food containers. Most of our food labels are trilingual. Labeling Systems are designed to meet a variety of food safety needs. National Checking Circle Trilingual Removable Label Friday Green - 0.75 in. 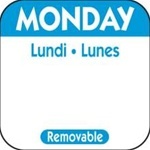 National Checking Circle Trilingual Removable Label Monday Blue - 0.75 in. 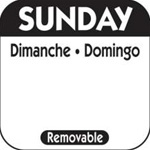 National Checking Circle Trilingual Removable Label Sunday Black - 0.75 in. National Checking Circle Trilingual Removable Label Thursday Brown - 0.75 in. 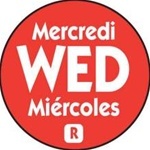 National Checking Circle Trilingual Removable Label Wednesday Red - 0.75 in. National Checking Circle Trilingual Removable Label Saturday Orange - 0.75 in. 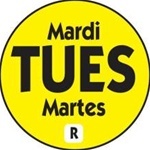 National Checking Circle Trilingual Removable Label Tuesday Yellow - 0.75 in. 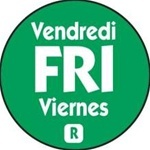 National Checking Trilingual Removable Label Friday Green - 1 in. x 1 in. National Checking Trilingual Removable Label Monday Blue - 1 in. x 1 in. 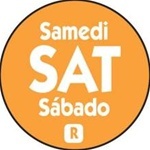 National Checking Trilingual Removable Label Saturday Orange - 1 in. x 1 in. 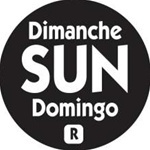 National Checking Trilingual Removable Label Sunday Black - 1 in. x 1 in. National Checking Trilingual Removable Label Thursday Brown - 1 in. x 1 in. National Checking Trilingual Removable Label Tuesday Yellow - 1 in. x 1 in. National Checking Trilingual Removable Label Wednesday Red - 1 in. x 1 in. National Checking Product Remolvable Label - 1 in. x 2 in. 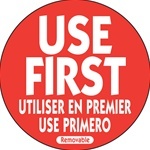 National Checking Trilingual Use First Removable Label - 2 in. 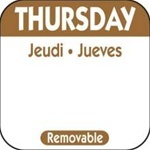 National Checking Trilingual Item-Date-Use By Removable Label Friday Green - 2 in. x 3 in. 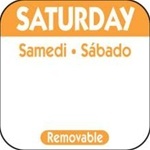 National Checking Trilingual Item-Date-Use By Removable Label Saturday Orange - 2 in. x 3 in. 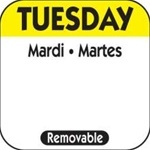 National Checking Trilingual Item-Date-Use By Removable Label Tuesday Yellow - 2 in. x 3 in. 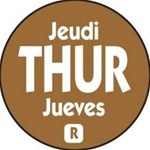 National Checking Trilingual Item-Date-Use By Removable Label Thursday Brown - 2 in. x 3 in. National Checking Trilingual Item-Date-Use By Removable Label Wednesday Red - 2 in. x 3 in. National Checking Item-Prep Use By Removable Label - 2 in. x 4 in. National Checking Removable Product Label - 2 in. x 4 in. 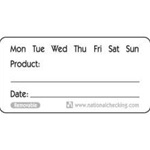 National Checking Shelf Life Removable Label - 2 in. x 4 in. 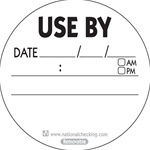 National Checking Circle Use By Removable Label - 3 in. National Checking Plastic Label Locker With 7 Rolls Removable Dispenser - 2 in. National Checking Plastic Label Locker Removable Dispenser - 1 in. Blank DuraPeel Removable Label - 2 in. x 2 in. Buy your restaurant supply Removable Food Labels from the leader in restaurant supply. 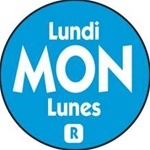 Choose from circle or square food labels. DateIt food rotation labels, dispensers and portion bags are available in an internationally recognized color-coding system for food safety and inventory rotation.